American church members are under suspicion of child-trafficing scheme. Members of a church group that tried to take Haitian children out of the country may have succumbed to an urge many humanitarian groups feel but resist, aid organizations say. Ten American Baptists were scheduled to have a hearing today in the Haitian capital after trying to take 33 children out of Haiti at a time of growing fears over possible child trafficking. The church members, most from Idaho, said they were trying to rescue abandoned and traumatized children even though they lacked the proper paperwork to do so. "The instinct to swoop in and rescue children may be a natural impulse," Deb Barry, a child-protection expert with Save the Children, said in a statement Sunday. "The possibility of a child being mistakenly labeled an orphan in the chaotic aftermath of the disaster is incredibly high." Instead of ferrying children out of Haiti, Save the Children and UNICEF say they're working to register children, including the 33 traveling with the Baptist group, to reunite family members who may be looking for one another. The incident comes after Haiti's government halted adoptions over concern that parentless or lost children are more vulnerable than ever to child trafficking. Social Affairs Minister Yves Cristallin said the Americans were suspected of taking part in an illegal adoption scheme. 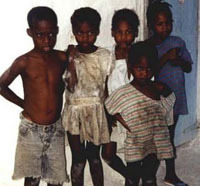 The group said its "Haitian Orphan Rescue Mission" was an effort to save abandoned children from death by taking them to an orphanage across the border in the Dominican Republic. The church members were arrested Friday night on a bus traveling with earthquake survivors ages 2 months to 12 years. "In this chaos the government is in right now, we were just trying to do the right thing," the group's spokeswoman, Laura Silsby, said at the judicial police headquarters in the capital where the Americans were being held. No charges had been filed. "Just because it's a natural disaster doesn't mean you can cut corners under what is under normal circumstances a legal and well-thought-out process," Patrick McCormick of UNICEF said. McCormick said his group always observes the "long and arduous process" of tracing family members after any natural disaster. United Nations guidelines recommend waiting at least two years before considering placing children with adoptive families. The children, some of them sick and dehydrated, have been taken to an orphanage run by Austrian-based SOS Children's Villages, which was trying to find their parents or close relatives, SOS spokesman George Willeit said. The Baptist group planned to put up 100 kids in Cabarete, a Dominican beach resort, at a 45-room hotel that the group was converting into an orphanage. U.S. diplomats met with the detained Americans and gave them bug spray and rations, according to Sean Lankford of Meridian, whose wife and 18-year-old daughter were held. "There are allegations of child trafficking and that really couldn't be farther from the truth." USA Today has contributed to the report.